This book was a long time coming and is an interesting read. 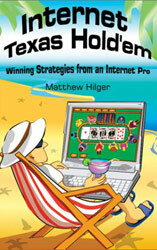 While it is mainly about good plain fixed-limit poker strategy, Hilger writes from the perspective of an internet player used to the increasingly loose games that now dominate the 'net. You'll gain a better perspective on online games, and he does cover online tells and similar topics at the end of the book even if not in great detail. The actual strategy discussed in this volume isn't anything earth-shattering. He basically takes what Lee Jones outlines in Winning Low-Limit Hold'em and gives it a little bit of a gambler's touch. I don't always agree with his tactics, such as raising or calling with bottom pair, but apparently he has been successful with this approach. He also incorporates some internet-only strategy into the book, but it really isn't the bulk of the text. A good chunk of this book is in practice hands which are good for developing players to test their own skills. While I don't always agree with some of Hilger's starting hand standards (they seem overly loose to me) he does provide a useful chart that I recommend new players copy and keep by their computer for Limit ring games. To sum it up, I don't think that advanced players will be missing anything by skipping this volume, but if you're looking to get in some extra practice hands and read some insights from a successful player you might wish to give it a look. Also, you might find some value in his discussion of online tells - even if they aren't the most reliable.